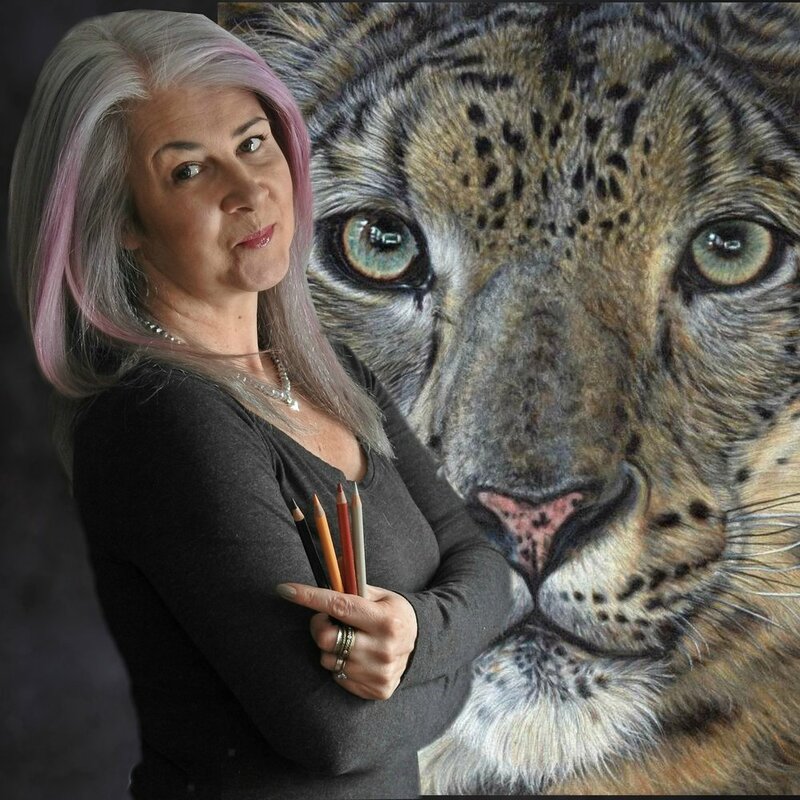 Lisa Ann Watkins, the artist behind Animal Art by LAW is nowadays well known in the world of coloured pencils as a multi award winning artist & tutor but below is a little of her own journey to how & why she got to where she is now. Despite going on from school to study art & then advancing on to graduate in Fashion & Textile Design in 1992 Lisa had by then fallen out of love with her art, and thanks to some of her tutors, her confidence had also long since disappeared. She turned her back on her art & design work but 20 years later , after suffering many recurring bouts of depression, a counsellor encouraged her to get back in touch with her creative. In August 2012 Lisa purchased her first set of coloured pencils & she has never looked back. Pushing herself outside of her comfort zone entering global art challenges, of which she won 2, by Christmas 2012 she was taking on private commission work. It was time to take a huge leap of faith to give up the security of a well paid job in Jan 2013 to try to succeed full time as an artist. The first few years she worked hard to further develop her skills & pushed herself to create as much as possible, both through commission work & also her own personal artwork. She held her first solo exhibition in 2014 & was very fortunate to have her work published in numerous magazines. She steadily built a large following on social media & was becoming well known in her chosen field of coloured pencil work, but despite all of the awards & successes, and the order book being full for months at a time, she felt there was still something missing. Lisa’s followers constantly asked for more information about her creative techniques so she put together her first digital tutorial in 2016. Astounded at how well it sold she followed this up with a couple more & this then led on to people wanting her to teach with a more formal, structured approach. In Feb 2017 Lisa held her first workshops in the UK. She was amazed that they were selling out in just under a couple hours! Despite the apprehension & the nerves, the workshops proved to be the missing piece of the jigsaw. Helping others to build their own confidence & to embrace their own creative was a bigger reward than any sale or award she had achieved to date. Within weeks she was invited to teach a workshop tour of America by Ann Kullberg which again was a huge success & another sell out. Lisa continued to create tutorials & teach her workshops but this still was not enough for those that could not make the physical workshops so in July 2017 she set up her first formal teaching channel on Patreon. She had to change her whole way of working & it has taken many months to get the balance just right. She now creates in depth videos & written tutorials for her online students every month & now teaches over 300 people around the world. She has now said a sad farewell to the commission side of the business that she started out on initially to focus full time on her teaching. She has been invited to join prestigious tutoring teams of renowned art educators such as Chapel Cottage, the Courtyard Art Studio & the SAA. She works closely with Faber Castell & also Clairefontaine to strive to take things forward. In the brief moments where she has some official downtime Lisa continues to work behind the scenes creating art & lending a voice to the animals with no voice in rescue, raising both funds & awareness. She can often be found out in the Forest of Dean where she now lives either walking her many rescue dogs or with a camera capturing images of the local wildlife for future artworks.